Nikon has launched a new instructional video series aimed at photography enthusiasts seeking insights and perspectives on how to use their cameras and other photo gear. All videos in the Behind the Scenes series will be free to watch on Nikon’s YouTube channel and its brand new Google+ page, regardless of whether they own Nikon equipment. The first video launches today, with a new video available every two to three weeks on both channels until all 15 videos are posted. Whereas there are plenty of videos out there targeting novice photographers, these new Nikon videos are aimed at advanced enthusiasts seeking to learn more about what they are capable of doing with their camera equipment. 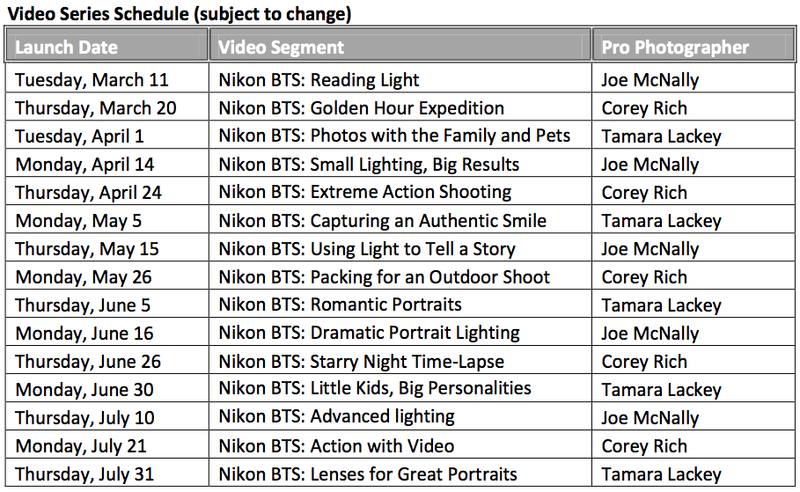 Three Nikon professional photographers—Joe McNally, Corey Rich, and Tamara Lackey—are contributing five videos each. They’ll offer tips on lighting, lenses, posing models, shooting landscapes, working with different subjects, and gearing up for a shoot. Each photographer will concentrate on their own areas of expertise. McNally will explore lighting and what is possible with Nikon Speedlights and off-camera flash techniques. Rich will delve into techniques for shooting portraits, time lapse, action stills, video, and capturing the extreme shot. Family photographer Lackey will share techniques for getting the best portraits. The videos will show Nikon professional photographers using pro-level equipment, however, the series will also showcase advanced-level gear that most viewers will actually have on hand. In addition to work from Nikon Ambassadors and Professional Photographers, the new Google+ page will also serve as a hub for users to share their own photos, techniques, and behind the scenes stories. Nikon currently offers a large set of resources for photographers on its Learn and Explore page as well.